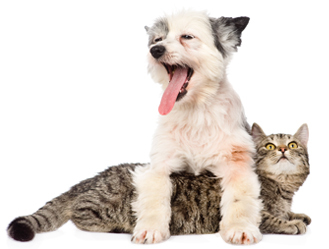 By paying attention to your pet’s oral health, you can make dental cleanings easier. As with your own mouth, regular maintenance and check-ups play a vital role in your pet’s oral health. Clenz-a-dent® offers a variety of products to help you with your pet’s oral hygiene routine. Regular dental care at home can help promote normal periodontal health between professional cleanings. Many forms of home dental care are effective at reducing the accumulation of dental plaque and bacteria. The solution you choose will depend on your pet’s current oral health, your own lifestyle and preferences, and the recommendations of your veterinarian. Regular visits to your veterinarian are important to your pet’s health. Your veterinarian will perform a complete dental exam and then recommend an oral care regimen tailored for your pet and your lifestyle. If your pet is experiencing specific problems, treatment is sometimes necessary and may include professional teeth cleaning and polishing, periodontal treatment (to treat gum disease), and dental surgery such as tooth extraction or medications for infection or pain. Consult your veterinarian today to determine the appropriate oral hygiene regimen for your pet, including one or more Clenz-a-dent products. The Clenz-a-dent family of products have been designed to be easy to use. Consult your veterinarian to choose the method of application that is best suited for your pet based on his current oral health and your own lifestyle and preferences. These Clenz-a-dent products combine ease-of-use with great taste to support clean teeth and fresh breath. Clenz-a-dent rinses can help keep teeth clean and freshen breath. close to you that carries Clenz-a-dent® products. RF2 is a registered trademark of ArtuVet Animal Health B.V.